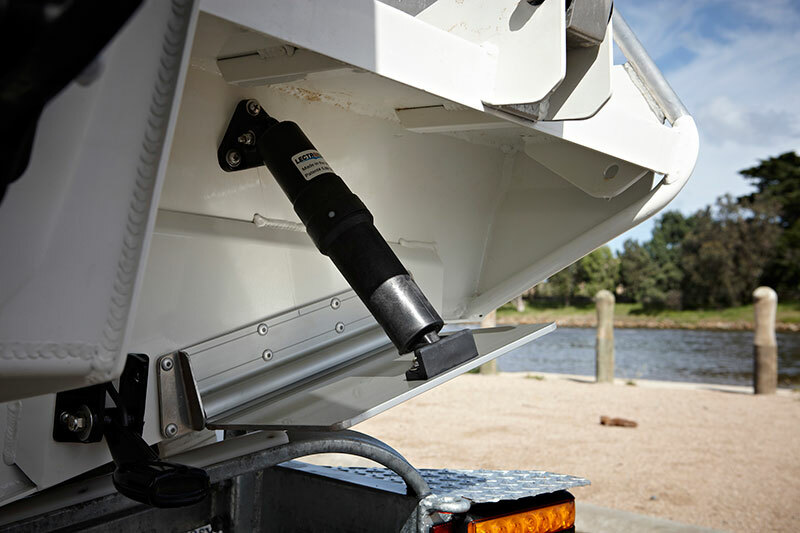 Bar Crusher’s innovative Bar Tab™ trim tab system has been specifically designed for its award-winning range of Australian-made, plate aluminium boats. Performing the same function as other trim tabs – allowing lateral trim adjustments (to correct heeling/leaning – common in deep-V hulls) – the significance of the Bar Tab system is in its registered-design hinge mechanism. Bar Crusher director Peter Cleland said the trim tab system was yet another intelligent design that was exclusive to the company. “The Bar Tab system uses an electric actuator, which does away with the old-fashioned hydraulic system, alleviating problems caused by leaking hydraulic pumps and hoses,” Mr Cleland said. “The last thing you want when you’re miles out to sea and facing a long run back to the ramp in terrible conditions is to discover your trim tabs aren’t working. The trim tabs themselves are constructed from super-strong 6mm anodised plate aluminium. A concept that came out of Bar Crusher’s R&D department, the anodised aluminium construction eliminates the problem of stainless steel trim tabs causing corrosion and paint disturbance – a common occurrence when stainless steel plates are fitted to aluminium boats. The Bar Tab system is fitted as an option on all Bar Crusher models and is available as a retro-fit kit from Bar Crusher dealers for older boats.